One common cause of foundation settlement is expansive soils. When dirt	or clay gets wet due to heavy rain, broken water pipes or poor drainage,	they expand. When they dry out due to drought, they contract. This movement	causes the soil under your home or commercial property to settle and shift	at an uneven rate, compromising the stability of the structure. 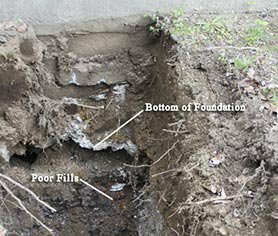 When an excess of water is constantly present, due to poor drainage or	plumbing leaks, the soils that support your foundation can quickly erode. It’s important to check gutters and plumbing on a regular basis to	prevent foundation problems. While fairly uncommon, one cause of foundation settlement is improper compaction	of soils at the time of construction. If a builder did not properly prepare	the site before the foundation was poured, soils are much more likely	to shift and settle. Trees can consume massive amounts of water. It’s certainly possible	for roots to cause foundation issues, but usually the problem with trees	is that they pull water away from the soils supporting the home. This	causes soil contraction and foundation problems. 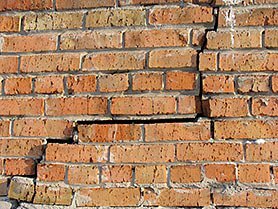 The most obvious signs of a foundation problem is cracked bricks. Expansive	soil swells when it gets wet and compacts when it becomes dry. 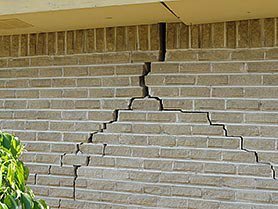 This constant	expansion and contraction causes uneven movement of the home’s foundation,	usually resulting in cracking bricks on the exterior. 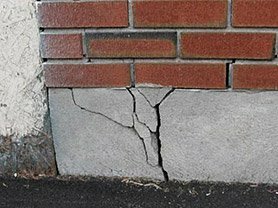 Cracked bricks often have a zig-zag pattern following the mortar joints. However, these cracks can run vertically cracking the bricks themselves,	horizontally or in any combination. It is important to realize this is	a symptom and not the problem! If you fix the cracking bricks by patching	or filling you’re not addressing the real issue. Lots of money has	been wasted by filling cracks or even rebuilding portions of walls just	to have the problem continue to worsen. Your chimney is generally the heaviest portion of your home. Chimneys are	usually attached to a support wall with mortar and other braces that cannot	support a chimney if the footing settles. This can create a dangerous	situation in which a heavy portion of your home becomes unstable. It is	important to have chimneys inspected as soon as you see signs of cracking,	shifting, leaning or settling. Simply attempting to fill in gaps with	mortar or caulking can lead to more damage and costly repairs. Many homeowners assume that if a house is new then the foundation must	be strong. Unfortunately, this is a very common misconception. 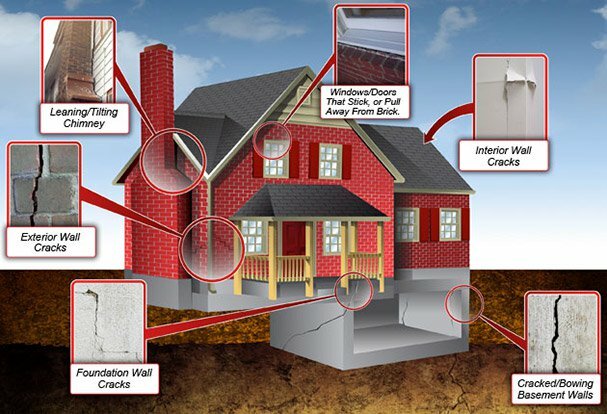 No matter	how old or young a home is, cracks and other foundation problems are still	possible. These issues can worsen or be compromising the structural integrity	of your home. If the problem is not addressed the strain will continue	on an already weakened structure.